This week I attended the Conscious Capitalism organization’s CEO-Summit in Austin, Texas with my ICE colleague Carter Phipps. 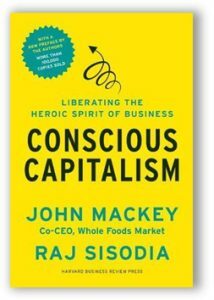 Our ICE colleague John Mackey, co-author of the book Conscious Capitalism and co-founder of the movement was also there too, of course. Conscious Capitalism began about ten years ago and has now become a large and vibrant movement. Its high-energy CEO-Summit was attended by close to 400 leaders who are dedicated to raising consciousness in businesses around the world. In addition to its annual conference, the movement now includes local chapter organizations in over 20 States, numerous international chapters, and ambitious plans to increase its profile and impact. 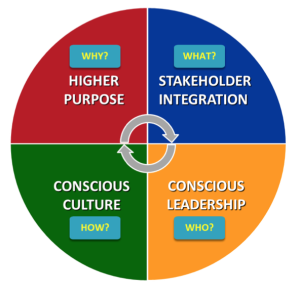 This new approach to business is based on four key tenets: 1) higher purpose, 2) stakeholder integration, 3) conscious leadership, and 4) conscious organizational culture. Unlike other approaches to “corporate social responsibility,” Conscious Capitalism helps identify and harness the intrinsic service value or transcendent meaning, beyond just making money, that can be found at the heart of almost every human enterprise. Once clarified, this intrinsic higher purpose is then used to bring all of an organization’s activities into alignment with its underlying transcendent mission. The CEO-Summit featured many inspiring examples of people and organizations that are making the world a better place. 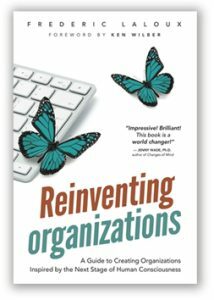 But for me, the most interesting experience was hearing bestselling author Frederic Laloux present his 2014 book, Reinventing Organizations. This book describes the stages of development in culture and consciousness, which have been previously outlined by the authors of Spiral Dynamics, as well as others, including me. Laloux adds to this well-established stage theory his contention that self-managing teams are the quintessential feature of organizations that embody the “integral” or “post-postmodern” stage of development. The power of self-managing teams has been popularized by the Holocracy business management system, which is now used by innovative organizations such as the Zappos online shoe store. As several presenters at the Conscious Capitalism conference emphasized, self-managing teams can be a worthwhile innovation in certain types of organizations. 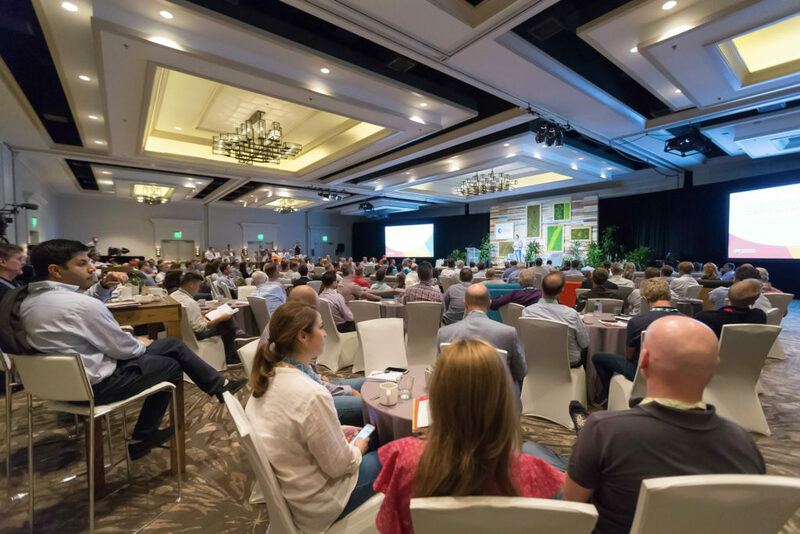 And by inviting Laloux to give both a keynote presentation and a breakout session on his book, the conference organizers clearly signaled their encouragement of his work. However, there were also some interesting tensions which are worth reporting on. Laloux stated that integral-level organizations (or “Teal organizations,” as he calls them, following Ken Wilber’s color scheme) are not concerned with competition. When I originally read this in his book I balked, so I was keen to ask him about it. Answering my question during the breakout session, he explained that when a company is truly mission-driven, forwarding the mission is its primary concern, even at the expense of preserving itself as an organization. Laloux used the example of a government funded, self-managing Dutch nursing company that provides free consulting to its competitors to help them adopt its best practices and imitate their success. According to this “Teal cooperation strategy,” when this nursing company selflessly helps its competitors get bigger and better, the company can then in turn borrow these improvements from its competitors, forwarding its larger mission of improved healthcare for everyone. However, while I agreed that this strategy of unconditional cooperation is noble and worth pursuing in certain circumstances, I suggested that the value-creating capacity of cooperation is ultimately tied together with competition in an interdependent polarity. That is, when competition and cooperation work together in a mutually correcting relationship that provides for both challenge and support, the value-creating potential of both poles of this polarity are maximized. In business, competition drives excellence and prevents organizations from devolving into complacent bureaucracies. So if Teal organizations eschew any competitive motivation, not only will they be less dynamic and effective, they will fail to adequately serve their stakeholders, which include not only shareholders, but also employees, suppliers, the community, and the environ ment. Beyond my critique of Laloux’s failure to recognize or incorporate the value-creating polarity of competition and cooperation into his description of Teal organizations, others pointed out that a truly integral-level organization should be flexible enough to employ different management structures in different situations, rather than seeing self-managing teams as the only way to go. As my colleagues and I discussed the presentation afterwards, we agreed that Laloux’s emphasis on cooperation, to the relative exclusion of competition, was essentially an expression of the progressive postmodern values frame. Indeed, healthy competition is an indispensable aspect of the “heroic spirit of business” that has improved our world immensely. And while business overall certainly needs to become more conscious, in order to improve it we need to clearly recognize its strengths as well as its weaknesses.